Carl Maxey grew up in an orphanage and became a leading attorney, civil rights activist, and champion of the underdog. He was adopted by a Spokane, Washington, couple immediately following his birth in Tacoma but ended up in the Spokane Children’s Home after his adoptive father disappeared and his mother died. When Maxey was twelve the Home’s Board decided it would no longer care for African American children and he was placed in the Spokane County Juvenile Detention Center. Years later, he said "So if you wonder where some of my fire comes from, it comes from a memory that includes this event." Maxey served as a medic during World War II, then won an NCAA boxing championship while in law school. In 1951 he became the first African American to graduate from Gonzaga Law School and to practice law in Spokane. 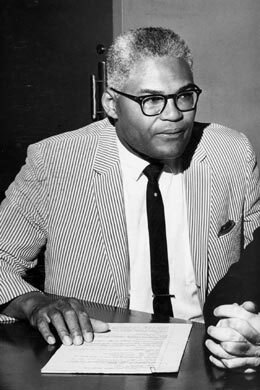 Maxey was active in the civil rights movement from the start of his practice. In one of his first cases he helped Eugene Breckenridge (later head of the Washington Education Association) become the first African American teacher in the Spokane school district. In the 1960s Maxey went to Mississippi with two other lawyers after the murder of three civil rights workers, James Chaney, Andrew Goodman, and Michael Schwerner. Maxey also became an outspoken critic of the Vietnam War, which he saw not only as unjust and unnecessary, but also as unfairly impacting African Americans. A longtime Democratic Party activist, in 1970 he represented the party’s anti-war wing in a primary challenge to pro-war Senator Henry M. Jackson. Known as a brilliant attorney and persuasive orator, even by local officials he frequently opposed, Maxey handled controversial and high-profile cases throughout his career. He defended accused criminals, helped women gain contested divorces, represented conscientious objectors, and once convinced Washington’s governor not to send a prison escapee back to Georgia where he was facing execution. Maxey’s two sons, William and Bevan, both became lawyers and practiced with him until his death on July 17, 1997. Bill Morlin, “Spokane Loses a Champion: Carl Maxey ? 1924?1997: He Defended Civil Rights and Controversial Clients,” The Spokesman?Review, July 18, 1997, p. A1; Marsha King, “Maxey Was An Inspiration: Black Attorney’s Example of Activism Cherished,” The Seattle Times, July 18, 1997; "Carl Maxey (1924-1997)," Equal Justice Newsletter, April 1999 (http://www.courts.wa.gov/programs_orgs/pos_mjc/?fa=pos_mjc.display&fileID=new9904#A4);HistoryLink.orghttp://www.historylink.org Online Encyclopedia of Washington State History, "Maxey, Carl (1924-1997)" (by Jim Kershner) and "Senator Henry Jackson overwhelmingly defeats peace candidate Carl Maxey in the Democratic primary on September 15, 1970." .